Tucked away inside a volume of The Quarterly Journal of Science, Literature, and the Arts1 is this short contribution by Michael Faraday. Faraday is not particularly well-known for a writerly style although in his huge output of papers and books he was a very effective communicator. I found in this article, "On a Peculiar Perspective Appearance of Aerial Light and Shade" , that he was really very elegant and perhaps even poetic in describing what I think are cloud shadows-- explaining the illusions created by cloud shadows, with the "aerial perspective" part perhaps not having to do with what is normally assumed to be the optical/painterly version of the term, although frankly I'm not sure. "Although the appearance on this evening was exceedingly beautiful and rare, and the more striking from the absence to the observer of the sun or clouds, and the complete insulation of the phenomenon, yet by close observation upon other evenings, it was found that partial effects of the same kind were very common, and from the manner in which these could be observed the explanation above given fully confirmed." "All these phenomena with their variations were easily referrible to their causes and may be observed at almost any sun set in fine weather, but the effect of the first evening so similar in kind though so different in appearance was not again remarked. It is with a view of guarding persons who may observe the same effect against any mistake as to its origin that the appearance with its nature has been thus particularly described." I haven't read that much in Faraday, but this does seem to be a bit of a departure--in form and content--and so I thought I'd share it a bit. 1. The Quarterly Journal of Science, Literature, and the Arts (of the Royal Society of Great Britain). London, printed by John Murray, volume XXII, 1827; 8.5x5”, viii, 418 pp,, 3 engraved plates. Other interesting contributions in the volume include: (Thomas Young), "Practical Application of the Doctrine of Chances, as it regards the Subdivision of Risks (by a Correspondent)"; (Michael Faraday, signed "M.F." in the article), "On the Confinement of Dry Gases over Mercury", in the Miscellaneous Intelligence section, pp 220-221; John MacCulloch, "Observations on the Geological History of the Formation of Coal"; and these shorter notices from the "Miscellaneous Intelligence" section including Wollaston "On Electro-Magnetic Rotation" and Becquerel "On the Conducting Power of Metals for Electricity" pp 374-378. And of course the images are beautiful, and wouldn't stand a chance at being recognized as a found-art form for another two decades with the first appearances of non-representational art (as art). 1. Shelford Bidwell, "Some Experiments with Selenium Cells", pp 250-256, found in The London, Edinburgh, and Dublin Philosophical Magazine and Journal of Science, (edited by William Thomson, George Fitzgerald, and William Francis. Printed in London by Taylor and Francis), volume XXXI, fifth series, January-June 1891. viii, 523pp, 6 engraved plates. I found this down in the warehouse this morning, published in Popular Science Monthly, September 1951. It sin't every day that you see a periodic table with drawings showing the employment of the elements, especially the stained glass windows for the element with the atomic number 92. Actually uranium glass was a "thing" once upon a time,, at least until the Cold War kicked in, putting a crimp in the supplies of uranium for glass plates and beads and that sort of thing. All of the following may be purchased via the blog's bookstore, here. Rees, WIlson Lowry, London, 1802. Rees, WIlson Lowry, London, 1805. Build Your Own Chemical Slide Rule! The copy of the slide rule that I'm using here is found in the great encyclopedia by Abraham Rees and which was published a few years later (1818)--its just a sharper copy with different design details than found in the original. 1. Full text of the 1814 paper: William Hyde Wollaston, "A Synoptic Scale of Chemical Equivalents," Philosophical Transactions of the Royal Society 104, 1-22 (1814). This hand-out pamphlet seems to be a case where the sale of an edible product is made for the sale of its packaging. The pamphlet shouts that CANDY IS DELICIOUS FOOD, which is certainly a correct statement if food=digestible. It tells/sells the story of candy as a profit-maker to the grocery seller, saying that "32% average gross profit on home consumption units", those delicious-sounding unit-things being the candy. There are bits and pieces about candy display and placement, all on the advice of the maker of the stuff that in which the candy was wrapped--cellophane. The publisher and distributor of the pamphlet, the "Cellophane" Division of the E.I. du Pont de Nemours & Co. Inc., had a huge vested interest in candy sales: candy was mostly wrapped in Cellophane (starting with Whitman in 1912) and by the time du Pont achieved its water- and moisture-proof Cellophane in Delaware the product accounted (in 1938) for 25% of the company's profits. That's pretty big, and so candy as a major muncher of Cellophane would be promoted by du Pont as pretty big, too. And as food, for added Bigness. August Hofmann (a German organic chemist of high calibre, 1818-1892) made this presentation1 to the Royal Institution in 1865, and it is one in which hand-made three-dimensional models of molecules2 are used for one of the first times for public demonstration. (He actually made parts of it in different lectures, that is, but I have not yet been able to compare the two.) The models aren't quite three-dimensional, as Hofmann arranged them so that they would have at least 3-D molecules though their arrangement in space was veyry much liek they would appear on a piece of paper. (This might be a bit off, and the molecules were all the same size, but the colors he employed to represent molecules are still being used: black/carbon, yellow/sulphur, white/hydrogen, blue/nitrogen, red/oxygen, green/chlorine. 1. HOFMANN, August Wilhelm. “On the Combining Power of Atoms”, in three parts, all in The Chemical News, October 5, 1865, pp 166-169; October 13, 1865, pp 175-179; and in October 20, 1865, pp 187-190. 2. The idea of molecules goes back 2000 years, to Empedocles, Leucippus, Democritus, and Epicurus. It should be noted I guess that the modern idea of the world (mostly?) owes itself to an 1873 article in Nature by James Clerk Maxwell. He titled the paper, well, "Molecules", and this is how he defined his terms: "An atom is a body which cannot be cut in two; a molecule is the smallest possible portion of a particular substance." Browsing the 1874 volume of the London Punch an interesting but truly bad poem slid from the page. The poem certainly suffers from itself, but there are interesting insights, and poetics aside there's some good thinking going on in spite of a probably-very-quick composition time. Of the young World’s proto-prime! Of the young World’s proto-prime. I found this very useful timeline presented in a not very friendly way at the about.com site. I couldn't help but to coyp it and clean it up a little to make it a little more accessible. Caveat: none of this is my own work--all of the credit for putting this list together goes to Anne Marie Helmenstine, Ph.D. The original site for the list is About.com. "Here's a helpful table chronicling the discovery of the elements. The date is listed for when the element was first isolated. In many cases, the presence of a new element was suspected years or even thousands of years before it could be purified. Click on an element's name to see its entry in the Periodic Table and get facts for the element." JF Ptak Science Books Quick Post Part of the History of Anticipation series and the History of Blank, Empty and Missing Things series. 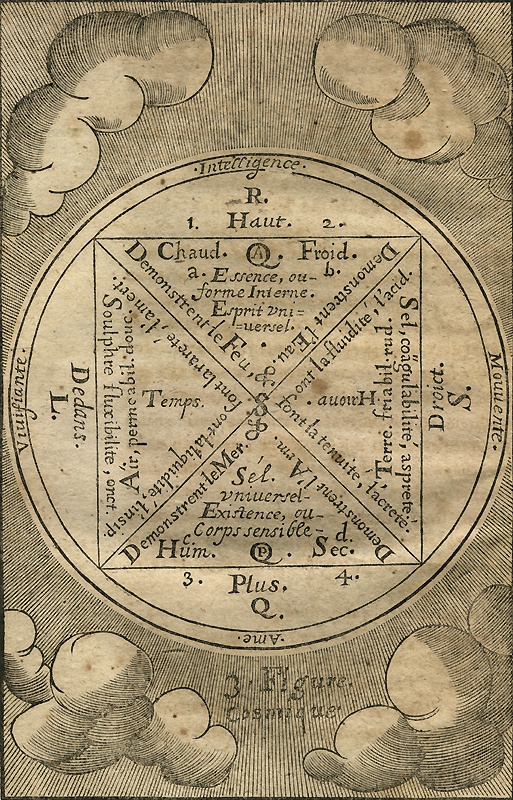 Alchemy is far from my strong suit (or even a weak suit), but I was intrigued by this engraving found in Annibel Barlet's Le Vray Et Methodiqve Covrs de La Physiqve Resolvtive, Vvlgairement Dite Chymie: Represent Par Figures Generales & Particulieres. 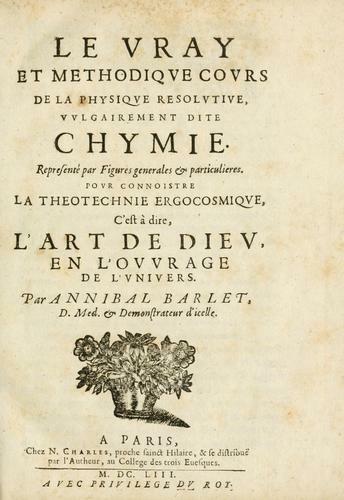 Povr Connoistre La Theotechnie Ergocosmiqve, C'Est Dire, L'Art de Diev, En L'Ovvrage de L'Vnivers..., which was ostensibly a work on alchemy, the second edition (used here) published in 1657. Taking a quick tour through the book it looks far more applied, far more medically-oriented, than a standard work on alchemy. (And by "medical" I'm really meaning "pharmaceutical.) I don't have the knowledge really to say much about the application of the Paracelsian alchemical chemistry and how much the various human natures/humors/metals etc. come into play with the prescription--I'd say offhand that the Rxs would be necessarily a little suspect. [Images courtesy of the Beinecke Library, Yale University]. I'm visiting the book here though because of the image above, showing the hands of the Primum Mobile (or god) about to see themselves busy with the job of creating everything. Or almost everything, as the shape of the container of All Things seems to be in place, held by the creating influence in an existence outside of the existence of existence. Perhaps the artist was just depicting the local existence, with the hands and etc. located in the space beyond the known solar system of 1657, showing the alchemical creation of order in the vast sea of chaos. It is curious to me how many concentric circles there are in the suggestive orb of possibilities, especially since the following image in Barlet's book shows considerably fewer place-holders. 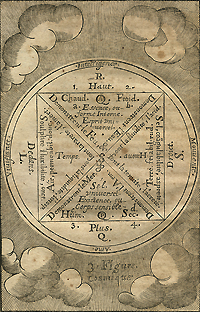 Perhaps this is all easily explained with a little knowledge of alchemical history, which is something that I do not possess--but for the time being, I'm very entertained by what might be an excitement in that first engraving of the things-to-come. Newton and his 351st Trinity Anniversary: a Note on Ending his Research in Alchemy. I've made a number of posts on this blog regarding the anniversaries of the Trinity atomic test explosion on 16 July 1945, out there in the desert--actually in the Jornada del Muerto, the Journey of the Dead Man/Dead Man's Walk, near Socorro, New Mexico. Its a bad piece of land if you wanted to cross it, especially if you went north-to-south, a hundred mile bit of an unrelenting waterless world. But that's not the Trinity I want to talk about now--today's Trinity is about as far removed from the flat piece of dry New Mexican earth as you can get, being the beautifully maintained Renaissance grasses of Trinity College at Cambridge. The call to this Trinity, today, is in observation of the 351st anniversary of the arrival of Issac Newton (1642-1727) at that college. 1660 is not an auspicious year in Newton's history, necessarily, but it is the beginning--Newton's enormous years would come in just a little bit, getting well underway during the Plague Years in 1665/1666, when he left the school to ride out the nasties in his native Woolsthorpe1. Myk favorite image of Trinity is the one above, printed not too long after Newton's return2, and after he had set up his own alchemy lab in a lean-to shack against the wall of the school (slightly visible here in the lower right corner.). Newton's decades-long run in the alchemy turnstile is well known, but what I'd like to know is why he gave it up. My feeling is that Newton believed he was missing a big something in his way of looking at and understnanding, expressing, the world. I think that he recognized the failing of physics and math to explain the vitalism (in the alchemical sense) of the world, and that alchemy might provide it. Thinking that this vital agent was in a way divine, in a way a product of divine interaction and participation, Newton may have used alchemy in the hopes that this area of study .would get him closer to that cause of all spontaneous processes that would explain all of the varieties and vagaries of living stuff. He might have viewed this creative process in the Old Testament sense of god using light at the beginning of the world, activity life in nothingness; Newton may have actually thought of this process as alchemical in nature. There has been much written on Newton and alchemy, and I know almost nothing about it. Knowing the anniversary was upon us, and seeing the print of Trinity, and seeing again that little shack where Newton spent so much concentrated effort, all conspired to make me think about what led Newton to give it all up. He stopped just as he was leaving the school for London to become director of the Mint, undertaking a big change in his life. His superhuman insight was about done by this point, even though his Optics would come a little later on, in 1704--most of that work was already completed, with Newton waiting, perhaps, for any troubles that he felt he was going to have upon the book's publication to fade away. And in this case, the problematic part did fade away, into dust, with the death of his long-worn enemy, Robert Hooke, in 1703. And its not that Newton faded away over the next few decades, he was still an exceptional powerhouse of an intellect to the very last, molding the new Scientific Revolution from his position as president of the Royal Society. And hen there was the oversight of the Mint. But he pretty much gave up alchemy around 1697, and that, as they say, was that. I wonder what it was that he found or didn't find; whatever it was, it wasn't among the million or so very chosen/careful/hidden/coded words in his (very) private (and not-intended-to-be-published) writings on the subject. What was in that final dot at the end of the last recorded sentence on alchemy, I wonder? The other part of this print of Trinity that I so love is in the foreground, where the artist--or engraver--decided for whatever reason to include a tiny scene of two fighting/playing dogs. Dogs and the shack, and the rest of the grandeur. 1. Newton graduated in 1665 without any particularly noted academic achievement. Of the plague years, Newton wrote: "All this was in the two plague years of 1665 and 1666, for in those days I was in my prime of age for invention, and minded mathematics and philosophy more than at any time since." Newton returned to the school in 1667 and was made a (minor) fellow; he took his masters in 1668, and in 1669, by the appearance and promise of his great genius, Newton was named Lucasian professor, filling the seat of Isaac Barrow. Newton was 27 years old. "The more Newton's theological and alchemical, chronological and mythological work is examined as a whole corpus, set by the side of his science, the more apparent it becomes that in his moments of grandeur he saw himself as the last of the interpreters of God's will in actions, living on the fulfillment of times."--F.E. Manuel, The Religion of Isaac Newton (1974). Our sea of air is composed of atoms, and the atoms are mostly nitrogen (78%) and oxygen (21%), and the atoms are of course all around us; though as obvious as it is, as present as it is, the most active component of air, oxygen, remained under-discovered until relatively late in human history. Oxygen is present in all major classes of structural molecules in living organisms and in all manner of inorganic compounds, and is When it was discovered, it really wasn’t; or it wasn’t discovered and recognized until the second time around. But the stuff that was whirling around its near discoveries were important in themselves for their constituent parts. “…in general, substances that burned in air were said to be rich in phlogiston; the fact that combustion soon ceased in an enclosed space was taken as clear-cut evidence that air had the capacity to absorb only a definite amount of phlogiston. When air had become completely phlogisticated it would no longer serve to support combustion of any material, nor would a metal heated in it yield a calx; nor could phlogisticated air support life, for the role of air in respiration was to remove the phlogiston from the body." The other thing that happened was that the phlogiston released into the air could not on its own support life. That meant it wasn’t not oxygen, it was the opposite of oxygen: anti-oxygen. Anti-oxygen is an interesting, very science fiction-y topic, a very cool brick for the edifice of contracting imaginary worlds. But in the world of the late 17th century and for another hundred years, it as the material of theory. Joseph Priestly on the other hand did actually discover oxygen in 1774—or at the very least was the first to get into print about the discovery, establishing priority over Carl Wilhelm Scheele who seems to have discovered oxygen first in 1773 but was second in print on the matter--but he couldn’t believe his own results enough to dislodge phlogiston, and went to his grave an unredeemed phlogistonist. ((I admit to being pretty flippant here, as Priestly was an enormously talented man, at high rank in part of the great panoply of scientists; he was also a great political observer and pamphleteer who paid dearly for his morality.) It took Antoine Lavoisier’s beautiful experiment in 1777 that established the work of Priestly and Boyle beyond question, killing phlogiston once and for all. As a matter of fact Lavoisier also published his account along with a general treatise on chemistry in his Traité élémentaire de chemie—a book that looks remarkably fresh for being printed in 1789—completely it at age 47, just four years before he was guillotined for being seen as an enemy to the people of France. But that (along with the exceptional Mme. Lavoisier, is another story). The illustration above is actually from the 1738 edition of Becher. Giovani Baptista della Porta was a magus, or a natural magician*, who searched nature for similarities that would serve to build a broad template of forced understanding of seeming likenesses, looking for the great connector in the exceptional and the unusual, the stuff outside of the formerly Aristotlean world. Natural Magic is his magnum opus, an expansion of its earlier version (Magna naturalis) published in Latin in 1558, which Porta expanded to twenty sections in 1589. It was an encyclopedic work of vast proportions, a gold-mine of information and clever wishfulness, and very accessible due to Porta’s wide inter-personal travel**, very wide reading and critical abilities, clear reasoning and deep vision: the book was hugely successful, going into at least twelve Latin, four Italian, seven French, two German, and two English editions in the early modern era. Natural Magic, which first appeared in English in 1658, concerned itself with magic, alchemy, optics, geometry, cryptography, magnetism, agriculture, the art of memory, munitions, and many other topics, all grouped together and refined, distilled, into a cloudy assemblage of natural knowledge—it would end up that the magical whole was worth far less than the sum of its parts. But the parts were pretty considerable, and much of the information was spot-on for the time, not the least of which was a very capable demonstration and explanation of a lensed camera obscura. What I’m interested in right now though is the title page of the book. It turns out and as we can see in the top image of the title page, Chaos is not some subspace trajectory of cellular automata, or in Dr. Brown’s/Einstein’s dancing dust—it is right above us. This recognition of its regular, localizable structure probably does not support parameterization, or anything else for that matter, except to say that it is definitely “pretty”. The title page has nine illustrated compartments: the four corners depict the four elements, the two opposing middles show art and nature; the bottom shows the author, illuminated by the knowing sun. The top center image is the element showing “chaos”, which I’ve chosen to use a map, identifying where exactly chaos might be. I’ve not seen an antiquarian map identifying chaos, though I have seen a number showing lots of other non-existent places, like heaven and hell and purgatory and Eden and the Kingdom of Prester John, to name a few. But not chaos. On the other hand there are many different, substantiated, anthropomorphic objects that wind up in the sky in antiquarian images: there haven't yet been anything spelling out chaos, though there are many Hebrew names for the g*d incised and cut into plates of wood and metal. There are all manners of hands-of-the-creator, gearworks for the Primum Mobile, eyes, doves, geometric shapes, blazing fires, blazing iconic people, multiple worlds, flying people, and so on. But no chaos. These are just two examples of the alternative-to-the-sun-in-the-sky category, a wonderful image from Kenelem Digby's Demonstratio immortabiliitatis animae rationalis, printed in 1664. The other is a very striking example from J.B.von Helmont's surviving and prodigal (and prodigiously brilliant) son Franciscus Mercurius' Das Geheimnuess der Schoepflung. Printed in 1701, two years after FM's death (and years after his other brothers succumbed to the Plague), the book was a bit of an amalgamation of the author's vast and undisciplined interests, which sloshed over into the areas of magic, conjuring, Kaballa and astrology. He had more success editing and translating his father's works. I admit I'm taking a wide liberty with "chaos", and that the the first image could simply be the creator stepping in to rid the heavens of chaos, but I liked the idea of chaos being located on a map better. Mea culpa. Persia. . . . In the Persian language, a Magician is nothing else but one that expounds and studies divine things; and it is the general name of wise-men in that country. . . . Magic was begun in Persia by Zoroastres." ** A fair amount of information in this book was derived from his own house-bound Academia de Secreti—a name I now love!—a society of friends and scholars who discussed topics ranging from physiognomy to optics to cosmology to conjuring. The First Book of Natural Magick "Of the Causes of Wonderful Things." "Wherein are searched out the causes of things which produce wonderful effects"
The Second Book of Natural Magick "Of the Generation of Animals." "Showing how living creatures of diverse kinds, may be mingled and coupled together, that from them, new and yet profitable kinds of living creatures may be generated." The Third Book Of Natural Magick "Of the Production of New Plants." Which delivers certain precepts of Husbandry, and shows how to intermingle sundry kinds of Plants and how to produce new kinds. The Fourth Book Of Natural Magick "Of Increasing Household-Stuff." Which teaches things belonging to house-keeping; How to prepare domestic necessities with a small cost; And how to keep them when they are procured. The Fifth Book Of Natural Magick "Of Changing Metals." "Which treateth of Alchemy, showing how metals may be altered and transformed, one into another"
The Sixth Book Of Natural Magick "Of Counterfeiting Glorious Stones." The Seventh Book Of Natural Magick "Of the Wonders of the Load-Stone." The Eighth Book Of Natural Magick "Of Physical Experiments"
The Ninth Book Of Natural Magick "Of Beautifiying Women." The Tenth Book Of Natural Magick "Of Distillation." The Eleventh Book Of Natural Magick "Of Perfuming. " The Twelveth Book Of Natural Magick "Of Artificial Fires." The Thirteenth Book Of Natural Magick "Of Tempering Steel. " The Fourteenth Book Of Natural Magick "Of Cookery." The Sixteenth Book Of Natural Magick "Of Invisible Writing." The Seventeenth Book Of Natural Magick "Of Strange Glasses." The Eighteenth Book Of Natural Magick "Of Static Experiments." The Nineteenth Book Of Natural Magick "Of Pneumatic Experiments." The Twentyth Book Of Natural Magick "Of the Chaos. " Blank and Empty Things: Disembodied Celestial Hands and Arms, Part 3. This wonderful and dimly provocative image from Johann Siebacher's Wasserstein der Weisen, oder chymisches Tractaetlein.... *, a curious alchemy book of obscured pubom Johann Ambrosius Siebmacher'lishing heritage, printed around 1660, is a sort of standard celestially-disembodied standard, though in this case the torch-holding hand may be coming through a trinitarian window/hole in the sky, straight from the body of the Der Herr Gott. Or perhaps not: perhaps this is an illustration of alchemical genius emerging from a Biblical interruption in the sky, igniting a heart-held philosopher's stone fixed to a well-rooted sepulchre, the very tree of life. The religiously-robed folks are retreating into the deeper shadow without the sight of the gloriously-enlightened lump, plainly visible to the plain observer. Or not. Siebacher uses an epigram at the end of his book calling the whole chymical art into question: "It is an easy matter to prepare gold in the furnace out of metals: at times there is found a man to whom the secret is revealed. Why is not every alchemist rich? The reason is that one thing is wanting which many seek with anxious care. Common gold is not fixed, and, when brought to the test of fire, quickly disappears and perishes. But he who knows the tired gold, which at all times remains the same, and from which nothing is lost, he is the possessor of the true Art, and may be called a good and practical Sage and Chemist." Rich in vision, and in spirit, with holes in the pockets. *Johann Ambrosius Siebmacher. Wasserstein der Weysen, das ist, ein chymisch Tractätlein, darin der Weg gezeiget, die Materia genennet, und der Process beschrieben wird, zu dem hohen geheymnuss der Universal Tinctur zukommen, vor diesem niemalen gesehen. Darbey auch zwey sehr nutzliche andere Büchlein der Gleichformigkeit und Concordantz wegen angehenckt, nemlich, 1. Iohan von Mesung. 2. Via veritatis der einigen Warheit..., Frankfurt, 1619, 1661, 1703, 1704, 1709, 1710, 1743, 1762. The Sophic Hydrolith; or Water Stone of the Wise, That is, a chymical work, in which the way is shewn, the matter named, and the process described; namely, the method of obtaining the universal tincture. Chapter One: A BRIEF EXPOSITION OF THE WONDERFUL WATER STONE OF THE WISE, COMMONLY CALLED THE PHILOSOPHER'S STONE.